Maybe. They’re still not bad. Minnesota fans now what bad looks like. But after a 2-3 loss to the Los Angeles Galaxy, the air should come out of some of the slightly silly hype that swirled around this team after their opening two wins of the season. The Loons are winning some of the games that they couldn’t win last year. Chiefly: they are beating new and bad teams on the road. It does not necessarily follow that they should be able to easily boss around somewhat better teams on the road. The Galaxy—even missing Zlatan Ibrahimović and Romain Alessandrini—are one of those somewhat better teams. I’m skeptical of their credibility as contenders, but late on Saturday night they soundly beat United, who still seemed to be on Central Time. The final score flattered the visitors, who were outplayed for most of the match. The Loons were unlucky, in my eyes, to concede the game’s opening goal via a penalty call that should’ve been reversed (at the very least, had a penalty not been given on the field, I have a hard time believing that one would ultimately have been given). But they were subsequently the beneficiaries of a trademark howler from LA keeper David Bingham, who seemed to be trying to get out of the way of a rocket from Ján Greguš, instead of stopping it. In the end, the result was fair. Minnesota can take heart from their fightback towards the end of the match, during which they had several bona fide opportunities to equalize. They can also point towards the absence of Head Coach Adrian Heath, who stayed home recovering from a dental emergency. While the United manager has come in for plenty of criticism on these pages before, I sure find it hard to believe that the team was helped by his vacancy. But they also have to learn and adapt from Saturday’s match. The Galaxy were superior in nearly every aspect of the game. After five straight matches with the same line-up, two in preseason and three in the regular season, the time has probably come for some changes. The Loons have been predictable and exploitable, and this week they met an opponent who took advantage. The team has two weeks before their next match, although five key players will be out on international duty. They will play New England, who don’t look that good, then take on the Red Bulls, who do look good. In the two final road matches of their five week trip to open the season, three points and a more sophisticated tactical approach are the goal. 5. The Galaxy had Minnesota outnumbered in midfield. Each week so far, I’ve been writing about the interesting tactical decision by the coaching staff to play with Rasmus Schüller as a wide midfielder, and particularly how it has influenced the play of Miguel Ibarra on the opposite side, and both fullbacks. Los Angeles took advantage of some of the positional uncertainty that Schüller and Ibarra occupy. 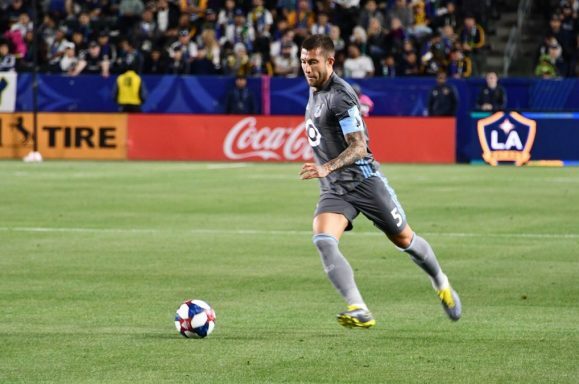 The Galaxy played with a 4-3-3, with Jonathan dos Santos, Joe Corona, and Sebastian Lletget in midfield, while the Loons countered with just Ozzie Alonso and Greguš. Three beats two, especially when the Galaxy three consists of such skilled players. This issue was obvious from the start of the game, and it presented Minnesota with a choice. They could aim to crash the middle with Schüller, Ibarra, and maybe Darwin Quintero, to create a numbers advantage in their favor. Or they could send these players as far wide as possible to create space on the wings. It seemed to me as if Minnesota could not really settle on an option. Schüller typically played more centrally, Ibarra typically played nearer to the touchline, and Quintero dropped deep. At best, the Loons did get four players in the midfield, but when they did so, they sacrificed almost all of the targets for them to pass to. The tireless effort in pressing by the Galaxy’s forwards (interestingly, this is something they would not have had if Zlatan had played) forced Minnesota to try to advance the ball quickly, but once they got the ball to the feet of Quintero, they were still often in their own half, Quintero was facing the wrong way, and the team had run out of forward passing targets. It was a struggle. 4. The three second half substitutions were overdue, and changed the game. Who knows if Adrian Heath would’ve pulled the trigger on the subsitutions earlier than Mark Watson did (prior experience suggests not), but when they came, they were exactly what the team needed to solve their spacing and numbers problems. In essence, the team switched its approach from trying to win the midfield numbers battle, to spreading the ball quickly out to the flanks and attacking directly. Both Ethan Finlay and Abu Danladi, who replaced Schüller and Ibarra, accomplished this. Meanwhile, Ángelo Rodríguez offered someone who could hold the ball up a little bit and give the team the time they needed to make runs, although the team rarely took advantage of this option and did not involve him much. You cannot ignore the influence of game states here, the Galaxy were tired and holding a two goal lead when these substitutions were made. But the Galaxy were kicking the Loons around when they were up 2-0 before the substitutions. There’s no doubt that the swaps made an impact. One big advantage of Minnesota’s attacking depth is the ability to offer these different types of looks. The Loons can throw a couple different pitches, and one takeaway from this game should be that they could be quicker and more decisive at changing the tempo. 3. It was a joy to see Abu Danladi back on the field. After last year’s injury-marred season, I think everyone has forgotten a bit what the young Ghanaian (he’s just 23) was and still is capable of. Against the Galaxy, Danladi was pretty sharp on the ball and aggressive in his runs. When he cut across the top of the box late in the match, I had flashes of his incredible Atlanta strike, before he struck the ball I saw it so clearly flying into the top corner. Alas, he missed, but the happy feeling I felt leap inside of me was the one that I took with me to the end of the game. Danladi of course, was the primary actor in Minnesota’s second goal. He made a quick and aggressive run into the box, placed his header nearly perfectly, and deserved a goal instead of a bounce off the post. But Rodriguez was alert enough to scoop up the rebound, and it galvanized the Loons all the same. I’m not sure if Danladi is fit enough for a starting role just yet, although two weeks of training could change that, but his impressive season debut should add more intrigue in the exciting race for Minnesota’s attacking slots. It’s anyone’s guess how the team looks in Foxborough, where Romario Ibarra, Schüller, Rodriguez, Finlay, Miguel Ibarra, and Danladi all must be in the mix for the three attacking positions around Darwin Quintero. 2. Minnesota were too passive in defending. The preseason talk around the Loons this year was about shape, shape, shape. The coaching staff was determined that the team get into their defensive shape of two banks of four as quickly as possible. That’s not a bad approach when you are up a goal or tied on the road, but it was abused by the Galaxy. There was a lot of hype about the game’s second goal, which involved a long build-up of 25 passes. But watch the video; the men in white shirts were rarely ever pressured on the ball. Basically all of these passes, including the hockey assist and the assist(!!) were simple and easy. Outnumbered in midfield, and with inadequate pressing from both forwards, the team was too easily moved around and picked apart. This same issue became a problem late in the game, when the Loons needed to win the ball back and try to tie the game, but the Galaxy knew they could pass it around and kill time off. Valuable minutes were wasted like this. While they can offer different looks in the attack, Minnesota’s defense is fairly simple and rigid. That has to change a bit as the year goes on. 1. Miscellaneous Notes. Glad to see that David Bingham received my check, the other half is in the mail… …Prepare for Greguš to take a bunch of long shots each game and about one in every four or five to be an absolute rocket that has a chance of going in, while the rest end up in Alexi Gómez territory… …Vito Mannone is so solid, he doesn’t panic with the ball at his feet, and he is decisive when deciding to catch or punch… …Cobi Jones is fine, but the lead broadcaster for the Galaxy earned my first announcer mute of the year. He didn’t even know the names of Minnesota’s players, so why bother knowing his?